Throughout the history of the Earth, droughts spanning seasons or even years have taken their toll on plant and animal life. In more recent U.S. history, a series of major droughts every 20 to 30 years have devastated farms, sparked wildfires and led to adverse health effects. Although the literature contains well-researched articles on the aspects and implications of drought itself, there have been few fact-based inquiries into how drought affects public health in the United States. Until recently. Last month, the Centers for Disease Control and Prevention National Center for Environmental Health published a guide to assist public health officials to prepare for and cope with drought in their communities. The document includes information about how drought affects public health, recommends steps to help mitigate the health effects of drought and identifies future needs for research and other drought-related activities. Among the CDC’s recommendations is to identify the populations that are most affected by a particular adverse condition. For instance, immune-compromised people drinking contaminated well water are most at risk of contracting infectious diseases. Once the affected populations have been identified, public health departments should actively collect and analyze quantitative and qualitative data to help determine the extent of the public health threat and the best steps to mitigate it. The publication also suggests additional research in numerous areas including identifying the health effects of reusing water, using surveillance data to determine which chronic disease are more frequently reported during a drought, and identifying pathogens that can be used as drought indicators. Intrigued? You can find the entire publication by clicking here. It’s summer-time in the Finger Lakes – a great time of year to sample regional wines along one of the three local wine trails. On your tour this year, you can pair that wine with some delicious, local cheese. 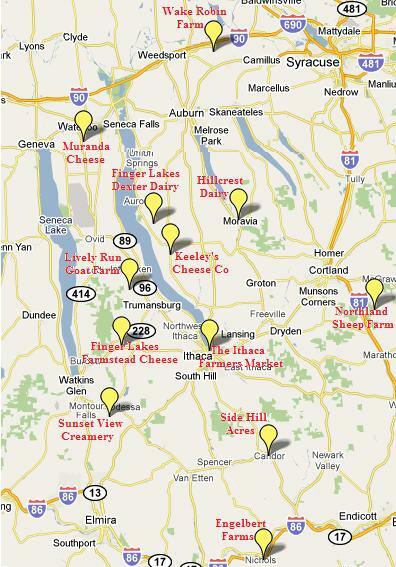 Cornell Cooperative Extension has teamed up with regional cheese-makers to create the Finger Lakes Cheese Trail – a driving tour of local creameries where you can learn about the craft of cheese-making and sample local varieties including sheep’s milk cheese, goudas, goat cheese, cheddars, jacks, Colby and even cheese curds. They’re absolutely delicious! But are they good for our diets? The evidence says yes. In fact, cheese provides a myriad of health benefits. A single serving of cheese provides about 300 mg of calcium – nearly one-third of the daily recommended amount. And a study published in the American Journal of Clinical Nutrition demonstrated that getting calcium from cheese rather than supplements leads to improvements in bone density. Cheese packs in other key nutrients, too, including like protein, magnesium, folate, B1, B2, B6, B12, and vitamins A, D, and E.
Unfortunately, there’s a downside to cheese. Many cheeses are also high in cholesterol, sodium and saturated fat, which can contribute to obesity, high blood pressure, heart disease and cancer. But that doesn’t mean you should eliminate cheese from your diet. If you like to eat hard cheeses , look for “fat free,” “reduced fat” or “low fat” versions. When looking for soft cheeses, low fat , part-skim or light products are available. If you do use full-fat cheese in a recipe, cut the amount in half to reduce your fat and sodium intake. So, go ahead. Melt some cheddar on that burger, sprinkle a bit of gorgonzola in your salad or visit a Finger Lakes creamery. As long as you indulge in moderation, you’ll reap all of the health benefits from cheese. I love the Ithaca Farmer’s market. It’s a regular Sunday ritual in our household to drive down to the market’s home on the shore of Cayuga Lake, listen to local musicians, have breakfast courtesy of the baked goods booth, and of course fill our re-usable bags with local produce. And we’re not the only ones: The “buy local” movement is rapidly growing nationally, based on the idea that we can reduce energy use and enjoy fresher food by purchasing items grown near our home towns. For those of you interested in research and evidence-based policy on this topic, I recommend to you the most recent issue of Choices Magazine, published by the Agricultural and Applied Economics Association. Unlike some other journals, Choices Magazine is available on-line, free of charge. The issue — Local Food—Perceptions, Prospects, and Policies — presents survey data, review articles, and policy analyses about local food, from a variety of perspectives. One question taken up by several authors is: What does “local” mean, exactly? Although “local food” is typically defined along the lines of a “geographic production area that is circumscribed by boundaries and in close proximity to the consumer,” the article by Michael S. Hand and Stephen Martinez shows that consensus stops there. I found the article by Yuko Onozaka, Gretchen Nurse, and Dawn Thilmany McFadden among the most interesting. They conducted a national survey to better understand the underlying factors that motivate consumers to buy local food. They also looked how these motivations vary among buyers living in different market venues. Why do people buy local food? 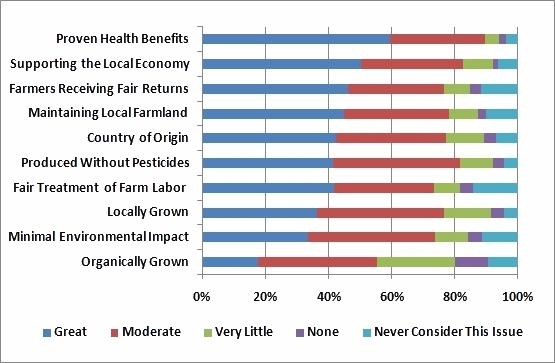 Somewhat surprisingly, they found the major motivation to be an interest in health benefits, followed by several “altruistic” reasons, like supporting the local economy and helping local farmers (see figure below). Overall, the take-home message is that most consumers think highly of locally grown products, and there is a large and growing market for food grown close to home. And hey, it gets people like me out of the house on Sunday morning! The venerable U. S. Department of Agriculture (USDA) has pioneered agricultural research for more than a century (see related post). Over the past several years, the USDA has been reshaping its research priorities and funding programs, in part through the creation of the new National Institute of Food and Agriculture. NIFA has the mission to “advance knowledge for agriculture, the environment, human health and well-being” through funding research, education, and extension projects. USDA has just published a “Roadmap for USDA Science,” that is worthwhile reading. It calls for new approaches to foster robust food, agricultural, and natural resource science. …Technologically advanced production, processing, and foodborne pathogen detection methods make food product recalls nonexistent. Farfetched, ask the authors of the Roadmap? Not at all, according to them — They believe that these goals are achievable through the kind of science the USDA will now promote. Among other things, the Roadmap calls for a focus on a limted number of “outcome-driven priorities,” cooperation with other agencies and institutions, concentration on both fundamental science and extension, and a “rejuvenation” of the USDA competitive grant system. All in all, a very interesting read.